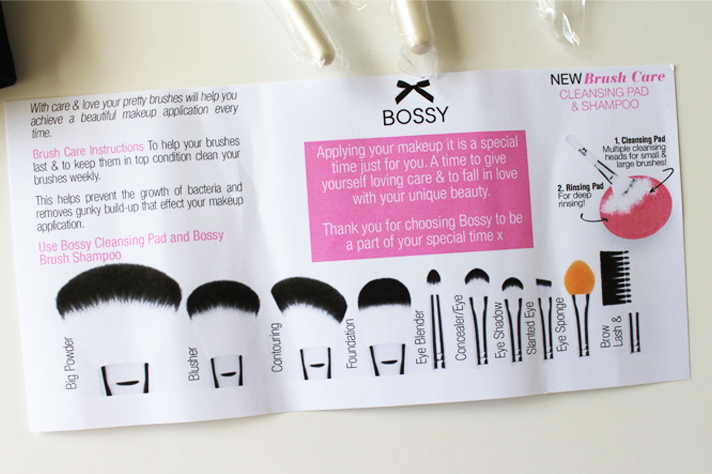 Bossy Cosmetics is a New Zealand based brand, which at the moment have a range of beauty tools and hair accessories which are also available at Farmers in store. 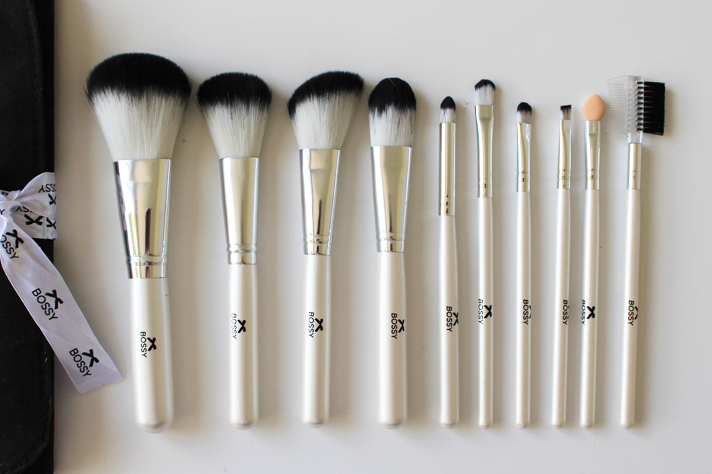 I think the most important thing about this brand is that it is all cruelty free with the brushes made of synthetic fibres. The Essential Makeup Brush Collection comes packaged in a simple cardboard box, with each brush individually protected and wrapped in plastic with plastic brush guards over the bristles. Each also comes with a handy brush roll, great for travelling and keeping your brushes in great shape. 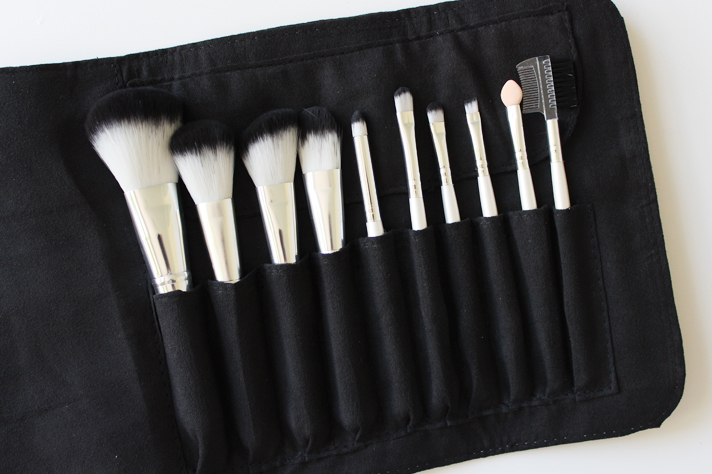 The set comes with 10 brushes, which would make the perfect set for a beginner, or even a makeup lover like myself to add into their beauty arsenal (one can never have too many brushes!) When I first got these out I was blown away with how soft they felt, even softer than the Real Techniques brushes (which don't get me wrong, I do love them). The brushes break down like so [left to right]: Big Powder (for powdering, even bronzing up the face), Blusher (small, and domed to help give a more precise blush application), Contouring (slanted, so you can really carve out the cheek bones), Foundation (large paddle brush to apply and blend foundations), Eye Blender (densely packed pencil brush, more suited to apply shadow under the eye or more precisely onto the lids), Concealer/Eye (flat brush, great for blending concealer under the eye, and packing colour onto the lids), Eye Shadow (shorter, and slightly harder than the Concealer/Eye, this is also good for packing on colour, but also allowing more focused application), Slanted Eye (good for brows, gel liner, or smudging out a pencil liner), Eye Sponge (good for packing on loose pigments), and Brow & Lash (use the bristles to brush through the brow hairs, and the plastic brush to get rid of mascara clumps). As you can see there is a a good array of brushes for most makeup jobs you might want to do. I think the two brushes missing from this that would make it near perfect would be; a larger fluffier blending brush for eye shadow, and a flat top style buffing brush (which personally I think does the best job for blending out foundations, BB creams etc, etc). But other than that the 10 brushes are pretty darn great. I just can't get over how soft they feel and the bigger ones really do a great job at applying product but also blending it out well too. I've not had any bristle shedding either which is very common in cheaper brushes. I was also worried about how the white bristles would hold up with lots of products, although they look beautiful, after a few uses they start looking a little bit mucky. But washing them was an absolute breeze; it just took a little bit of baby shampoo and warm water to get them looking as good as new, they also dried really fast as well. Bossy also offer a Brush Shampoo + Cleansing Pad kit (for $25.00), which has had rave reviews and it might just have to be my next purchase. 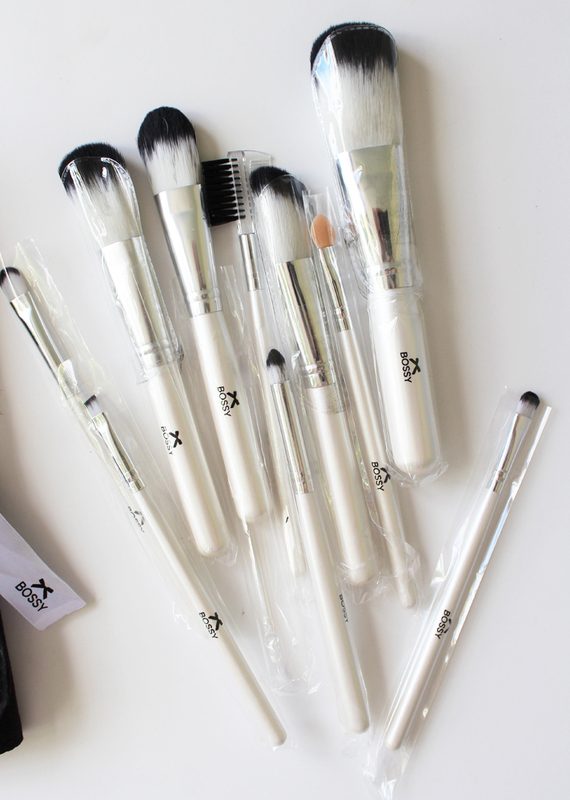 This brush set is currently on sale on the Bossy website, down to NZD $25.00, from $49.95. 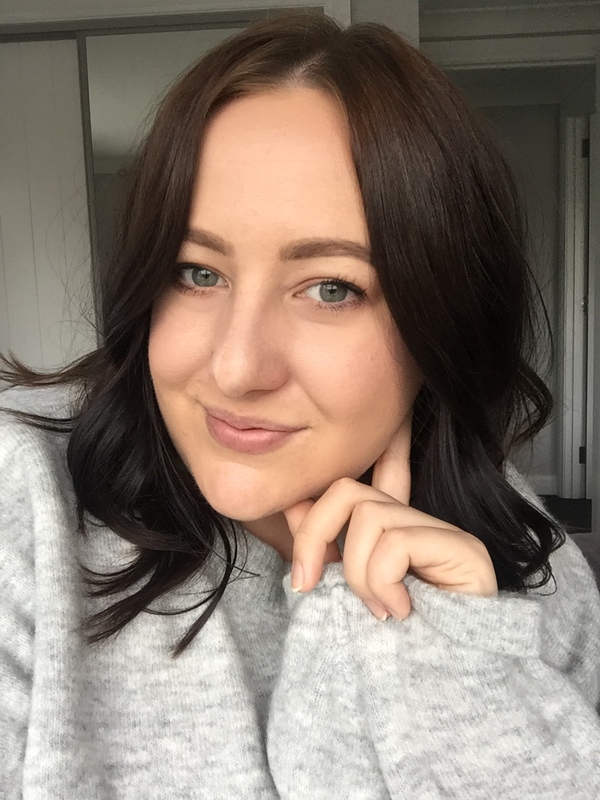 Another plus about this company is that they ship NZ wide for free, but also ship worldwide for free as well, not a lot of places offer that anymore! I think at $25.00, even $50, this is a great set to buy for someone, or for yourself and you definitely won't be disappointed in them. 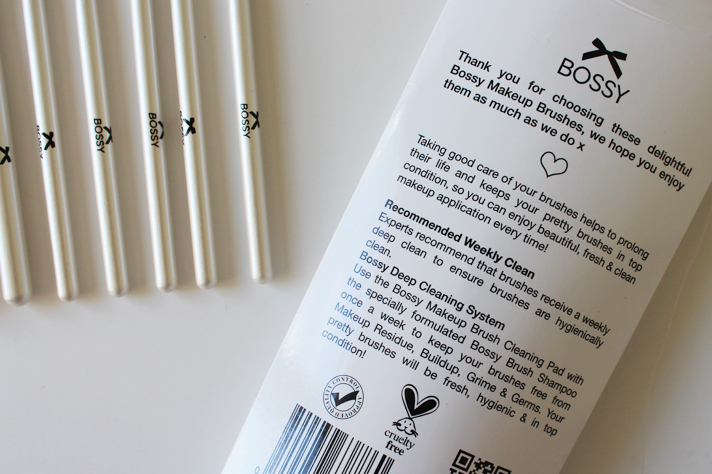 Have you used anything from Bossy Cosmetics before? What do you think of these brushes? *Sent to me by Bossy for review.